On several occasions, you need to rotate your MP4 video file on Mac or Windows for properly viewing it. Mostly when you record any video with your smartphone, it needs to be rotated sideways for properly viewing it on laptop. However you don’t have to worry now about rotating your MP4 video file as there are a number of software packages available in the market that will do the same thing for you. These utility software packages are available for almost all the platforms and can be easily downloaded from the internet for further use. Wondershare UniConverter (originally Wondershare Video Converter Ultimate) is one of the best video editing and formatting software packages available in the market. 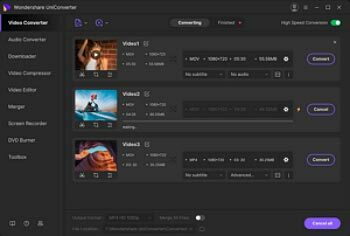 It offers a number of features to its users which involves integrated search engine (for searching your favorite videos), an array of editing options (including trimming and rotating) and facility to burn the DVD with your favorite MP4 video file. You can also upload your MP4 videos from your smart phone and edit it quickly in Wondershare UniConverter (originally Wondershare Video Converter Ultimate). While editing any video, you get a number of buttons displayed on your screen and can perform editing with just a simple click. Due to its easy user interface and huge number of features, Wondershare UniConverter (originally Wondershare Video Converter Ultimate) is one of the most popular video editing software packages among the users. Rotate video in MP4, MOV, MKV and other formats easily. Integrate all common editing functions like trim, crop, merge, adding subtitles, etc. Directly add videos from devices and transfer videos to iPhone/iPad with this editor. Directly convert MP4 to MOV, AVI, MKV, MP3 and other 1000 formats. Burn MP4 to DVD disk or Blu-ray disc to play with your DVD player. All-in-one toolbox: Add metadata, screen recorder, GIF maker, VR converter, Cast to TV. Step 1 Import MP4 file you want to rotate. Download, install and launch Wondershare MP4 Rotator on your computer. Simply drag and drop the desired MP4 file to the software interface or click Add Files to load the MP4 file. Step 2 Rotate MP4 video file as you need. Click the Crop icon under the video thumbnail to enter the Crop window, click one of the Rotation icons per your needs. Below is the description for the 4 rotation related options. Just click each to rotate or flip your MP4 video. The operation will immediately take effects and you can preview it in real time. Rotate MP4 video 90 degrees clockwise and continuously. Therefore, you can rotate video 90 degrees, 180 degrees, 270 degrees and no change. Rotate MP4 video 90 degrees anticlockwise and continuously, similar to the first one, but in anti-direction. 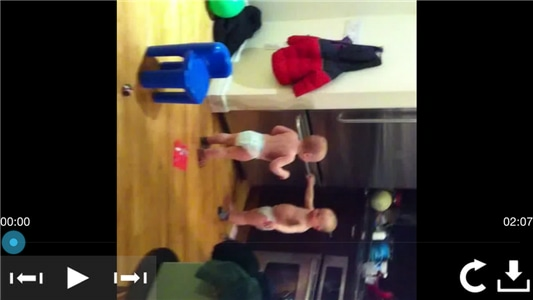 Flip MP4 video horizontally, upside down. Flip MP4 video vertical, left to right. Click OK to save the alteration. After that, select the output format as MP4. Just click drop down icon beside Convert all files to, and then select MP4 and the original resolution from the Video tab. Step 3 Export rotated MP4 video file. Finally, click Convert All to save the rotated MP4 file. And you can tab the Output icon to the rotated MP4 file. 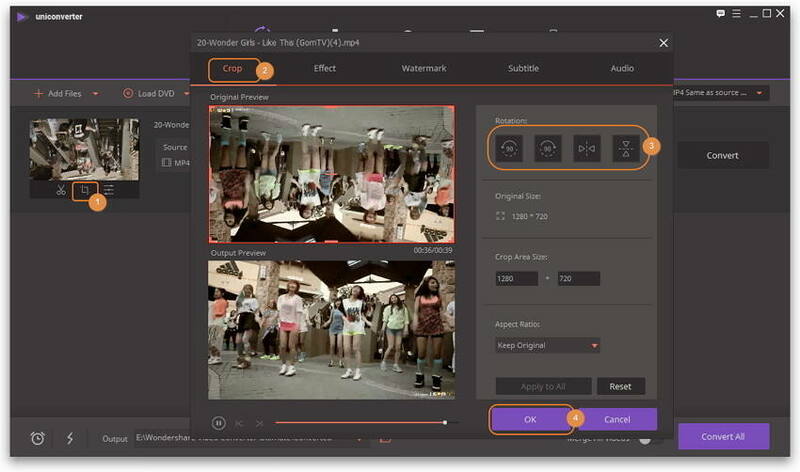 An extremely useful software for Windows platform, it allows the user to rotate their MP4 video 90 degrees in either clockwise or anti clockwise direction. 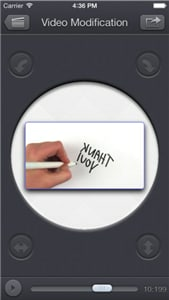 It also allows the user to mirror their video either upwards or downwards. Apart from MP4 file format, it works with various other video file formats like AVI, MPEG, FLV and MOV. 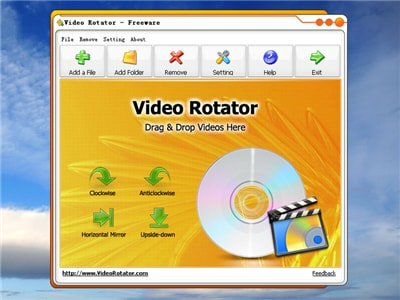 Free Video Flip and Rotate is ultimate video rotating software that has quite simple interface. You can rotate the video in any direction. There are just two menus in the software namely “auto shutdown” and “menu”. The menu contains all the actions that can performed on the running video. The software can rotate the video in either 90 degrees or 180 degrees. One of the best video editing software available in the market is Wondershare UniConverter for Mac (originally Wondershare Video Converter Ultimate for Mac)! You can download it for Mac platform and start downloading and editing your videos easily. Wondershare UniConverter per Mac (Wondershare Video Converter Ultimate per Mac) is a complete solution to all your video needs; be it downloading your favorite video from the internet or editing (rotating, trimming, shading) it. If you are not in a mood to spend a few bucks on downloading software for rotating your videos, then iMovie is a good choice for Mac users which comes inbuilt with the operating system. Spend a few minutes exploring its features and you will find how easily you can rotate your favorite MP4 video using iMovie. 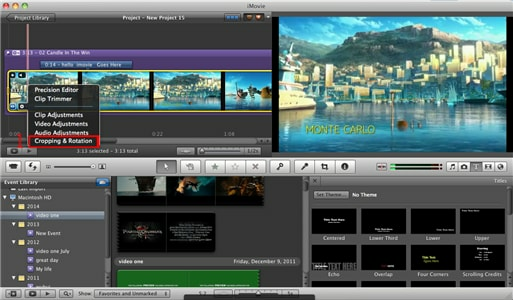 QuickTimePro is Apple’s video editor that is compatible with Mac as well as all Apple devices. This video editor supports a number of features including for video editing including video rotation. You can find some of the best tutorials of QuickTimePro online. However you will have to pay $39.99 for purchasing this software. As the name suggests, Video Rotate is a perfect iOS app for users who are looking for a simple tool to rotate their videos. 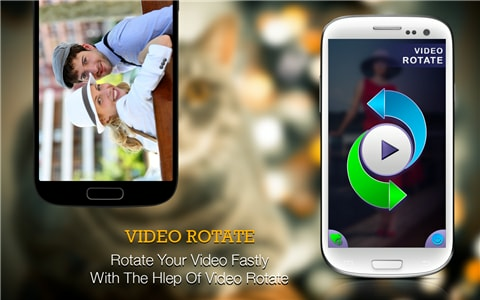 Compatible with all the latest versions of iPhone and iOS, Video Rotate is a highly popular app among the users. As the name suggests, the major purpose of this iOS app is to slim down your videos so that it takes lesser space on disk but the app also has a very handy video rotating feature. These are the two major features provided by this app. If you are looking for a simple tool just to rotate and mirror your MP4 videos, then Video Rotate and Flip is a useful app. Compatible with Iphone and iOS devices, this app is highly popular among the users. Rotating and flipping are the only two features provided by this app. Fast Video Rotate is a unique android app that offers a number of video editing features to its customers including correcting wrong playback and orientation, rotating videos and flipping them sideways as per the requirement. You can rotate your videos in 90 degrees, 180 degrees and 270 degrees according to your need. The user interface for this app is quite simple and with a few simple clicks, you can get the desired result. The rotated videos from this app work completely fine when played on other devices or uploaded on web. As the name suggests, Video Rotate is dedicated video rotating software that rotates your MP4 video either frame by frame or uses the video header to set the rotation. There are various benefits of both these types of rotation and you can get in depth knowledge about each of them through their tutorials. The app also provides you the facility to share the encoded file via Gmail, Dropbox etc. Apart from rotating your videos, you can also mirror them or change their resolution. 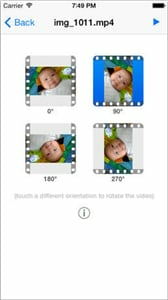 Rotate Video tool is a very simple android app that allows its users to rotate the videos by various angles. You can easily rotate your video by 90 degrees, 180 degrees and 270 degrees using this tool. The app claims that the rotated video will run correctly on all the devices. However the free version will not give you enough power and support as it contains ads and supports encoding of files upto 10 seconds only! If you want to enjoy the full version, then you will have to download its full version. RotateVideo.org is a completely free website where you can easily rotate your MP4 videos. Now you don’t need to download any software or app for rotating your videos. The website works fine with almost every video file format including avi, mpeg, MP4, wmv etc. Once you upload the video to be rotated, the website takes fairly low time for the rotation. You can rotate videos of any length using this website without even paying a single penny. MPEG-2 is an online website that supports a number of video operations like converting your video files from one format to another and rotating it. For converting your video file or rotating it, you can either upload the video on the website or you can even paste a link to the video located online. The speed of the conversion and rotation is fairly less and a 10 minute video should not take more than 4 minutes for the conversion and the rotation process to complete. Now you can easily edit your video files without having to download any special software or app for it. 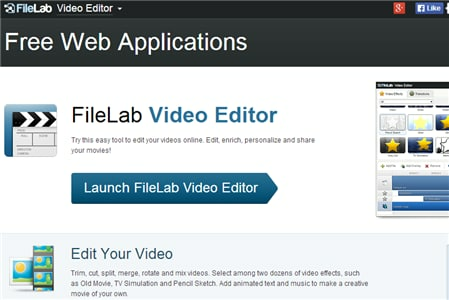 File Lab Video Editor is an online website that works very much the same way as your installed video editing software. You can edit your video file quickly and then download the resultant back to your computer. The website supports a number of editing operations like trimming, cutting, splitting and rotating. You can also manage your video files and make it compatible with your varied devices.